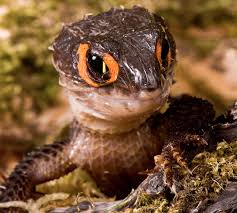 ​The Crocodile skink is a true insectivore, relishing small roaches (such as Dubias), small silk worms, small meal worms, small crickets, and small red worms (“red wrigglers”). 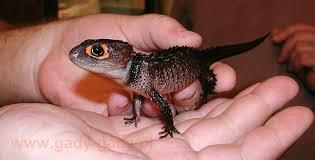 A rule of thumb for feeding crocodile skinks is the food item offered should always be live and only half the size of the skink's head. Hatchling and young lizards should be offered 2-3 food items once a day and adults should be offered 2-3 food items every other day. Feeder insects should be appropriately gut loaded by offering them dark leafy greens such as kale or endive and carrots (for added vitamin A) 24-48 hours before feeding to the skink. This method of gut loading helps keep the prey items alive longer. Always remove uneaten food after an hour.